Welcome to the NOVICA Men’s Robe Collection. 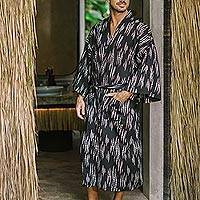 Naturally, comfortably soft with a front wrap, these men’s robes feature the finest cottons and rayons, decorated with the best batik patterns Indonesian artists have to offer. I bought this "Star Quest" pattern several years ago for myself. I have 6 cotton robes from NOVICA. This pattern is one of my favorites for around home. I also take it traveling; spa, beach, lounge, sleeping. I am purchasing another one for a gift. 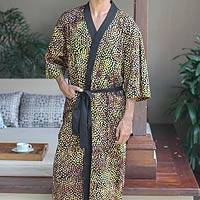 The basic men’s robe is taken to new heights in this fine collection of cotton and rayon robes for men, designed and decorated with traditional and modern batik patterns from Bali and Java. Each robe is made from the finest fabrics available and hand dyed in batik patterns that date back over 2000 years by Indonesian craftsmen and artisans. The work of these artists can be found nowhere else. They use techniques and motifs on these robes that are native to the regions in which they are made. The NOVICA collection of men’s robes is not only exceptional in the range of fabric and patterns, it also guarantees that the art of the craftsmen and women of Bali and Java who make these robes will be preserved for future generations.